Intrepid Annie Knappstein, currently cycling and walking 1500kms of the Camino de Santiago from Le Puy to Fisterra, has raised over 6,000 dollars so far with her project Ride & Stride to support the work of the Solomon Islands Rangers. Annie, former AVID volunteer with local Solomon Islands community conservation organisation SICCP, is committed to raising awareness of the Solomon Islands, its unique biodiversity, and the challenges faced by an almost invisible, and tiny task force of Solomon Islands Rangers. Solomon Island Rangers play a vital role in the sound stewardship of the rich natural and cultural heritage of the Solomon Islands, and they need support. With the pressure of logging, mining, expansion of subsistence and plantation agriculture, population increase, impacts of climate change and variability, isolation, years of civil conflict, and challenging politics, these extraordinary people deserve respect, encouragement, training and equipment for taking responsibility for the ecological integrity and resource management of the Solomon Islands. Through donations at the crowd funding site chuffed.org and with sponsorship from BSP and Honiara Rotary Club, Annie has already raised over AUD$6000 to support Solomon Islands Ranger training and equipment on her 1500km ‘Ride and Stride’ campaign across France and Spain. “It seems a responsibility for every business, community and individual as well as government to invest in sound resource management, not just conservation, at the community level in the Solomon Islands. Training and equipping these Ranger warriors at the coal-face has long term benefits for everyone,” she said. “There also seems enormous potential for Solomon Islands Rangers to become greater contributors to education, tourism, national and provincial resource management policy, and as implementers of current legislation”, Annie explained. So far Annie has ridden 700kms on a push bike along the Camino de Santiago route from Le Puy to St Jean Pied de Port in France, and to the 27th September had walked 190kms of the 800km of the Camino Francès. Her goal is to reach Fisterra. “Solomon Islands Rangers briefed local carver Randall Ako on the marine and terrestrial elements they wished to be represented by on my journey, so I proudly stride with a walking stick that has created conversations with local people and pilgrims from all over the world about Solomon Islands and its Rangers”, added Annie. All costs associated with the Ride & Stride campaign for Solomon Island Rangers are Knappstein’s financial contribution. Funds to support her cause are being raised through online crowd funding, corporate sponsorship and individual donations now and over the next 5 weeks of her trip. To learn more about Annie’s Ride & Stride story and to contribute to her cause: chuffed.org/project/ridestride. 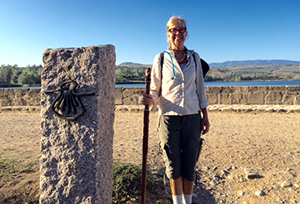 The CaminoWays.com team wishes Annie a Buen Camino! !